Grain mites are common kitchen pests that infest dry food products such as cereals, flour, grain, corn, cheese, dried fruits and vegetables, etc. They grow well in dark and humid conditions. These pests barely measure 1/10th inch and they are nearly invisible to the naked eye. Their presence often goes undetected until they have multiplied heavily. If you discover grainy dust in your food shelves, act immediately, as this indicates that your food items have been severely infested. 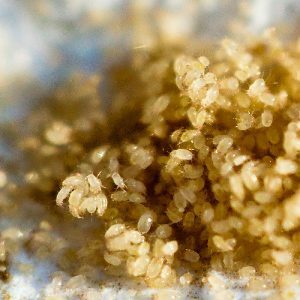 Grain mites are harmless to most people and thankfully, they can be controlled easily. So, do not panic and reach out for chemicals. Instead, try the safer alternatives mentioned below. Discard infested food as soon as you notice the infestation. Grain mites feed upon the germ of the grain, which is the most nutritious part. The infested food not only lacks nutrition but also tastes bad. Moreover, these tiny pests may contaminate the food with allergens and mold spores. When consumed or touched, they may cause baker’s itch or grocer’s itch in some person. The longer they stay in your kitchen or pantry, the more products they will infest. So, you need to find out how to get rid of grain mites quickly, as well as completely. Even one mite or its egg has the capacity to reproduce quickly under favorable conditions and re-infest your entire pantry. Sanitize infested bins, jars, and containers using hot soapy water and let them dry completely before refilling them. Clean the cabinets where infested food was stored. Wipe all the surfaces with hot soapy water. Mix one part of vinegar with 2 parts of water and spray in on the surfaces to kill the eggs and larvae if any. Natural insect repellents such as neem oil and orange oil are also great alternatives to vinegar. Mix one part of oil with 10 parts of water to make your own insect spray. Clean the crevices thoroughly, as these are the perfect hideouts for grain mites. Use a vacuum cleaner to sweep out the crevices and other such hideouts and make sure you throw the vacuum bag out of your house immediately. If a food product is not severely infested and you do not want to discard it, put it in an airtight container or bag and freeze it for a week. The grain mites will not be able to survive at such low temperature. Once the mites are dead, sift the food thoroughly and remove the dead mites. Once you have sanitized the kitchen, pantry or your food storage area, you must be very careful to avoid re-infestation. 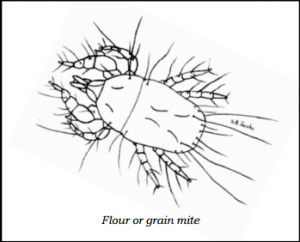 Flour mites cannot survive without humidity. If you’re wondering how to get rid of grain mites forever, the best way to do so is to keep your storage area well-ventilated. An exhaust fan can help you remove excess moisture. Store food products in clean, air-tight containers to keep the mites away. When you deprive them of food and moisture, they will eventually die. The life cycle of grain mites is about a month. So, once you have sanitized your kitchen or pantry area as mentioned above, clean it thoroughly every 15 days for about two months. This will help eradicate any remaining mites, their eggs, and larvae. Do not combine old food stuff with new purchases. Wait until the old stock is over and then, wash the bins with hot soapy water before refilling the new stock. If possible, buy products in small portion, especially if your pantry area is more prone to grain mites. When you buy them in small portion, you will most likely consume them before they get infested. Apart from its medicinal value, bay leaves are also popular for keeping mites and insects away. Tape a bay leaf on the lid of containers or on the cupboards and it may make your life easier. The above-mentioned tips should help you keep your food safe from flour mites but if you still experience frequent problems, contact your nearby pest control company for help.